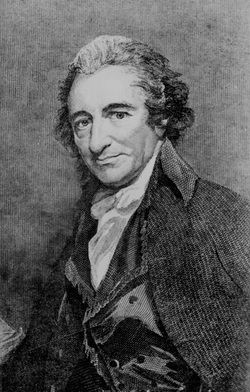 Thomas Paine argues for American independence from Britain in his book "Common Sense". He argues that dependence on Britain causes more harm than good, that America’s grievances are beyond reconciliation, and that it just flows with nature and the design of the Almighty that America should be independent. He implies the destiny of America is to establish equality, grant rights, and form its own government. When speaking of early American government he implies the destiny of America is to grant rights and equality. He says, "Securing freedom and property to all men, and above all things, the free exercise of religion, according to the dictates of conscience; with such other matter as is necessary for a charter to contain. "3 It is America’s right and destiny to establish its own government, as he puts it, "A government of our own is our natural right"4.
protecting themselves, are the proper objects for kingdoms to take under their care; but there is something very absurd, in supposing a continent to be perpetually governed by an island. "9 However, it is not just the size of the parent country, it is the distance. In fact, it is so far away that it would seem to be against God’s designs, according to Thomas Paine. "Even the distance at which the Almighty hath placed England and America is a strong and natural proof that the authority of the one over the other, was never the design of Heaven. "10 Britain is just too far away. Britain’s rule over America is not ordained by the Almighty. He even addresses the other side of the issue. One argument for maintaining dependence on Britain is that many colonists are descendent from Britain. Paine shows that this is not a good reason. America no more owes it’s parent country the right to rule than it does France. As most Americans were descended from the English, the original king was French. Throughout the short book, there are strong feelings of the need for independence. He presents simple facts and persuasive arguments. He alludes to God and nature to favor his side. With various tactics he moved the colonies with a simple book. Hundreds of years ago he saw America as it is today, an independent nation. He argued for the destiny of America to be the way it is to this day, fulfilled in freedom. Thomas Paine, "Common Sense," Chapter 5, p.3 (from CD "Experience History Interpreting America’s Past").